This project was pioneered by one Ms Debbie Chialtas from SoapyLove. Check out her SoapyLove blog here and her ultra creative project, The Soap Lab here. Debbie was one of the teachers at the Soap Intensive Weekend and she was gracious enough to share this fun soap technique that she designed herself. Thanks Debbie! Or you can get the kit for the entire project here. 1) Cut clear soap into small chunks, at least 3 ounces per UFO you’re making. Put into Pyrex cup and melt in microwave, about 15 seconds per ounce. Stir until all chunks are melted. If there are chunks that are unmelted, stirring a bit will help mix them in. If you accidentally boil your soap in the microwave, it can small bad and cause the soap to be more brittle. 2) In a small cup, spray a few squirts of rubbing alcohol. Add 1/8 teaspoon of mica (or a drop of non-bleed colorant plus 1/8 teaspoon pearl mica). Stir until smooth. 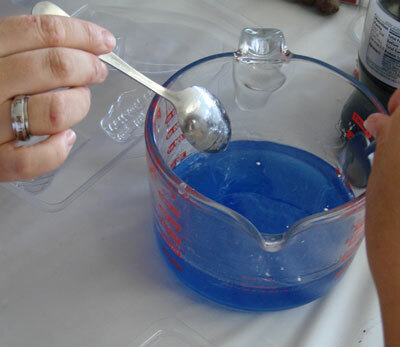 Add mica to clear soap and stir thoroughly. 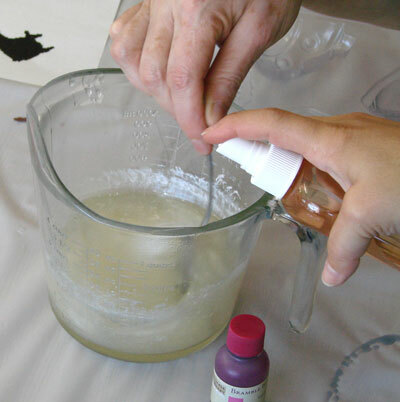 Add more colorant mixture if needed to get your desired color. Stir in a small pinch of soap glitter. Stir in your fragrance oil. Make sure to stir until your fragrance is fully incorporated into the soap. This usually takes around 30 seconds. 3) Pour into soap mold, filling to 1/8″ of mold top. Allow to set at room temperature until hardened. But, if you’re impatient, put in freezer for 10 minutes until solid. Don’t leave it in too long or you may get glycerin des on your soap. Save any extra soap to re-melt for future projects. Check back tomorrow for more instructions on making the UFO Soaps. Previous Post: Bleeding Colors? What’s That Halo!? Paula, I loved the Alien Soap Demo too. Debbie is so generous to share this with everyone. We’re lucky! My favorite part of the soap Intensive Weekend was Soapylove’s alien soap demonstration. Not only is it the cutest darn soap I have EVER seen but it give me SO many ideas. Mwhahahahahaha Love you Debbie! I see youre reading new books already! I can’t believe how quickly you go through books. I wish I got to read even half of the books that you do. The descriptions look awesome.